NEW YORK, New York, July 28, 2010 (ENS) – The National Park Service has awarded more than $29 million in contracts to repair the seawall on Ellis Island in New York Harbor, remove contaminants from one of the island’s historic buildings and upgrade the communications infrastructure. Opened on January 1, 1892, Ellis Island became the nation’s premier federal immigration station, processing more than 12 million immigrant steamship passengers before it was closed in 1954. Today, over 100 million Americans, one third of the population, can trace their ancestry to the immigrants who first arrived in America at Ellis Island. 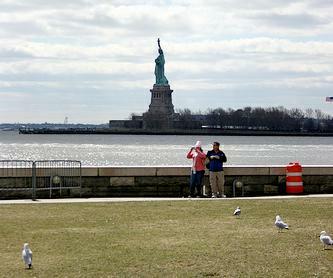 Ellis Island is located just off the New Jersey coast, within the shadow of the Statue of Liberty. A 1998 United States Supreme Court decision found most of the island to be part of New Jersey. Restored buildings on the island host a museum of immigration run by the National Park Service as part of the Statue of Liberty National Monument. The newly funded projects, all scheduled to start this summer, are part of President Barack Obama’s economic recovery program and will provide jobs and economic stimulation to the region’s economy while restoring one of our nation’s most treasured historic sites, said Interior Secretary Ken Salazar and U.S. Senator Robert Menendez of New Jersey announcing the funding on Tuesday. “These three projects funded under the American Recovery and Reinvestment Act will provide more employment opportunities to workers in the region while safeguarding the site where many of our ancestors first stepped ashore in the New World. The Recovery Act will leave a lasting legacy in America’s great outdoors, while putting people back to work and strengthening our economy,” Salazar said. Indian tribes had called it “Kioshk” or Gull Island and it was known for its abundant oyster beds and plentiful shad runs. Samuel Ellis became the island’s private owner in the 1770s, around the time of the American Revolution. Through the years, this gateway to the new world was enlarged from its original 3.3 acres to 27.5 acres by landfill obtained from the ballast of ships, and excess earth from the construction of the New York City subway system. In addition to serving as an immigration center, Ellis Island was used as a detention center for enemy aliens during World War II. It was also a processing center for returning sick or wounded U.S. soldiers, and a Coast Guard training base. “Ellis Island tells the story of our nation and connects millions of American families to their past, and I am pleased that we can finally begin to preserve it for future generations,” said Senator Menendez. The Park Service has awarded a $20.9 million contract to Phoenix Marine Co. Inc. of Sayreville, New Jersey to repair Ellis Island’s 6,700 foot long seawall. Small portions of the seawall have been stabilized and rehabilitated since the original construction, but the majority of the seawall shows deterioration. A second contract for $6.7 million has been awarded to APS Contractors of Paterson, New Jersey to stabilize the deteriorated Baggage and Dormitory Building on Ellis Island, remove environmental contaminants, and install a temporary new roof. The third contract for $1.5 million has been awarded to Cutting Edge Group, based in Lake George, New York to install electrical and communication infrastructure in conduit on Liberty and Ellis islands. The project will allow the National Park Service to better communicate between the islands and the mainland. The American Recovery and Reinvestment Act passed last year gave $3 billion to the Department of the Interior. Of that amount, $750 million in funding goes to the National Park Service. More than $30 billion in Recovery funds has been made available to New York  and more than $18.6 billion has already been spent. Meanwhile, more than $10 billion in Recovery funds has been made available to New Jersey  and more than $7.4 billion has already been spent.